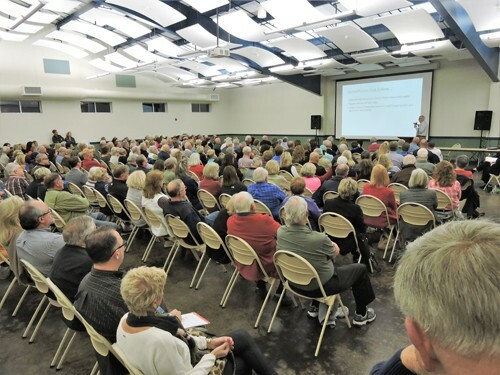 It was standing room only when more than 250 Kingwood residents crowded into the large public room of the Kingwood Community Center Tuesday night, Jan. 30, for a residents’ meeting called by Alan Potok. Potok is a flooded-out Kingwood resident and one of many who are actively organizing to get the disastrous conditions addressed that made the Hurricane Harvey Flood even worse than it would have been otherwise. More than 16,000 homes and 3,300 businesses in the Lake Houston area were destroyed or damaged. The attendees were not only from Kingwood but also from Atascocita, Humble and Huffman. The one thing they have in common: all were affected and remain vulnerable. The main objective of the meeting was to educate residents and enlist resident support. Residents were invited to sign a petition requesting immediate action by local, state and federal authorities to make changes regarding the San Jacinto River Authority to better mitigate flooding. In addition, the Lake Houston Chamber of Commerce “Plea for Three Initiative” for ing responsible public officials was explained in detail. Its coordinating group is now meeting on a regular basis. Its next meeting will be in the Kingwood Community Center Feb. 16 at 11 a.m.
Potok, a retired engineer specializing in flood mitigation and regional water supplies for the City of Houston and in California, opened the meeting with a comprehensive overview of what led to the flood and what it is going to take to fix the situation. “All you have to do to satisfy Kingwood right now [about what happened] is go out and do bathymetric [the study of underwater depth of lakes, rivers and oceans] and topographic mapping and all the sediment areas. Compare that with 1994, which you already have records of, and subtract the two sets of elevations and that tells you the volume of that sediment deposit,” Potok said. Bob Rehak presents dozens of his aerial photos of massive river silting and damage. He explained that if the river channel is dredged and that sediment volume is removed to have the channel able to be at its capacity while handling water releases from Lake Conroe, one has a relatively quick, albeit expensive, fix. Potok then addressed the longer-term solution. “Seek an alternative process for getting your design consultants and contractors to design and build the long-term solution which will take you years,” he said, noting that it may sound simple but it is not. “I want to share with you what you are up against when it comes to flood management and the Kingwood area,” Potok said. He explained the myriad of different agencies that were involved, including the San Jacinto River Authority, Montgomery and Harris Counties and the City of Houston. In addition, there is intense interest in the Texas Congress, the governor’s office and in Washington D.C., all of which will be involved in the process and funding of what will likely be a massive expenditure over the long term. Potok spoke mainly about the entire drainage area of the San Jacinto River Authority, which includes most, if not all, of Montgomery County, Lake Conroe and areas well to the north, east and west of Lake Conroe. He displayed a map of the entire 2,385-square-mile drainage area, of which Lake Conroe only accounts for 454 square miles. He focused on the narrow end of the map at its southernmost point where Lake Houston begins. “Look at how small that area is where it all funnels through the Kingwood area,” Potok said. Potok was followed by a slideshow of photos taken and presented by Bob Rehak, a retired Kingwood businessman long associated with the Kingwood Service Association Parks Committee and the community in general. The slides show in great detail the magnitude of the sand and silting problems on the San Jacinto (both forks), and the sizes of the accumulated sand bars in the river above Highway 69, along Forest Cove, Kingwood and especially River Grove Park. At the end of the meeting the speakers all remained to answer individual questions informally with residents. The next meeting will be in the Kingwood Community Center Feb. 16 at 11 a.m.